So back when I wrote that short mini-mix for Japan, I was reminded of something more relevant to the Spotlight / Shoutout universe. 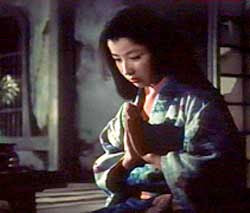 Back when I was in high school, and I had discovered an obsession with Japanese films, and there was one actress that greatly stood out to me. She was Kaoru Yachisuga. 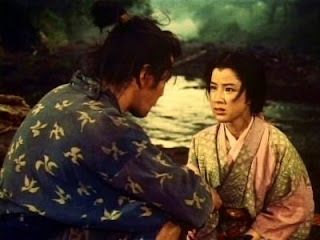 She has a career that spans over five or six decades, but really, in this post I am going to focus on where I know her from….playing the character of « Otsu » in the Musashi Miyamoto Samurai Trilogy directed by Hiroshi Inagaki. I just remember watching these films, and even after all of the skilled fencing, fight scenes, and Japanese historical imagery, the feature that stood out the most was the performance of Kaoru Yachisuga. She played her character with a feeling of innocence, and she made the role seem extremely captivating. It was like one of those charismatic persons that just draws you into them. Even my mother liked her, but I think my mother also liked Sonya Blade from Mortal Kombat, so……. mortal kombat was a GREAT movie. DO NOT HATE.